BLOOM is a European Horizon 2020 funded project which aims at supporting the implementation of innovation driven ambitions by strengthening dialogue and knowledge on bioeconomy and its possibilities. A sustainable bioeconomy promises to foster a circular economy and to enhance climate change mitigation, while reducing dependence on fossil fuels. Are European citizens well aware of bioeconomy challenges and possibilities? BLOOM takes up the discourse on bioeconomy considering its huge potential to contribute to a sustainable, circular economy and to mitigating climate change. However, BLOOM also actively considers ethical questions related to bioeconomy and risk anticipation finding new balances within the planetary boundaries. Some of these questions are related to topics like genetic modification in biobased refinery processes, the use of fertilizers, or the potential increase of the demand of some natural resources and the related increase of pressure on some ecosystems (the development of the bioeconomy is for instance likely to increase the demand of forest-based products). Besides sustainable production, a circular bioeconomy would want to optimally use waste streams. This has the potential to reduce the pressure on sustainable resource acquisition, and reduce pollution and environmental impact. In implementing a bioeconomy, choices for degradable products or collection systems can be made. BLOOM co-creation training in Wageningen, 3-4. October 2018. BLOOM is creating space to enable an open and informed debate on preferences and values and fosters interaction and exchange of information, knowledge, meaning and aspirations, with the aim of establishing consensus on how a sustainable bioeconomy can be realized. To do so the project team implements outreach activities using materials on bioeconomy, which are co-created by European citizens, the civil society, bioeconomy innovation networks, local research centres, business and industry stakeholders, researchers and representatives from various levels of government. In order to pursue its objectives BLOOM follows a multi-stakeholder approach by establishing: (1) five regional hubs which are fostering public engagement in the bioeconomy, co-create materials and activities on bioeconomy to be applied in the public space, and (2) a school network which co-designs and tests curricula for bioeconomy for primary and secondary education. School education needs more attention as it is merely disconnected from scientific (university level), societal or innovation issues. The establishment of a school network in BLOOM tries to help overcoming this gap. The hubs are located in the Netherlands, Spain, Poland, Germany and Austria, Sweden and Finland. They are focusing on different areas in the bioeconomy which are important for the respective region. BLOOM’s collaboration with schools involves teachers from nine European countries and Israel; thus covers a broad range of European school systems. BLOOM follows the approach to initiate activities on regional level, establish and strengthen networks there and further foster exchange beyond regional and national borders. After setting up the hubs and doing a detailed stakeholder mapping, the first activities targeting the BLOOM hubs and the school network have already started. The hub teams have expertise in both, bioeconomy and science communication. The teams have experiences in designing and moderating co-creation workshops. In October 2018 an interactive training format for the BLOOM team was applied in order to give room for exchange and learning from each other’s expertise. 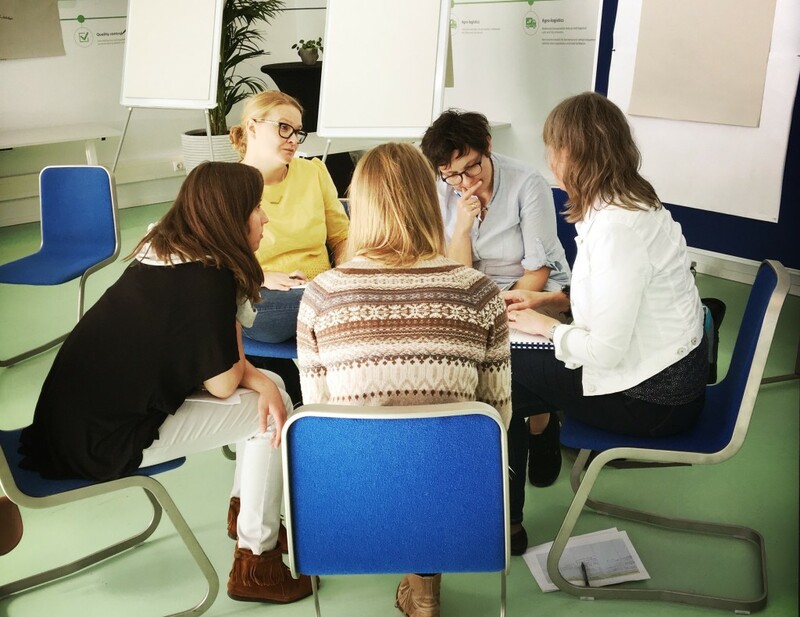 In the training they tested and experienced methodologies to be used in the co-creation processes of the hubs already targeting the topic of bioeconomy. This process allowed content related input from the bioeconomy experts and methodological input from the science communicator partners. Thus, the hub leaders got a range of co-creation methodologies appropriate for their needs. These methods foster eye level dialogue within multi-stakeholder groups and support processes to collectively design outreach activities and/ or materials. Based on the results of respective co-creation workshops which started in November 2018 the hub teams will implement the created activities and materials in spring 2019. The BLOOM teachers are intensively working on their ideas for bioconomy curricula. By coming together twice they developed and improved their ideas for five curricula. Also the teacher’s workshops followed a co-creation approach. The teachers brought in their different experiences in the different European school systems and thus developed curricula which can be used in these varieties of systems. Currently (November 2018), the teachers are testing their new curricula within their classes, and improve them accordingly. In a next step a MOOC will be developed to reach out to teachers who could not participate directly in the project. BLOOM is a communication and support action (CSA) aiming at establishing open and informed dialogues and activities on bioeconomy. It is running from November 2017 until October 2020 and the consortium consists of 12 partners from 8 European countries. For more info visit project website. Text provided by Judith Feicthinger and Maria Schrammel.